Feng-GUI simulates human vision during the first 5 seconds of exposure to visuals, and creates heatmaps based on an algorithm that predicts what a real human would be most likely to look at. 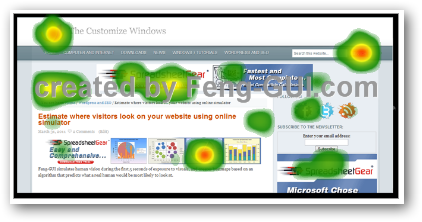 Use Feng-GUI attention analysis to realize which areas of the webpage, photo or advertisement gets most of the attention. Optimize the layout of a webpage, along with its buttons and banners. Identify weak spots within an ad and improve its performance. It has two versions, paid and free. Obviously paid has more feature than the free. Though the free will work great for small to medium blogs. You have to take a screenshot and upload it; the system will analyze and mark the hot spots. It shows that, our branding (the logo), placing of advertisements are absolutely right from a webmaster’s point of view. But, social connection icons are probably escape from at a glance view of the visitor. This Article Has Been Shared 2975 Times! The impact of writing skill is essential in the hypertext environment of the Internet. Inspired by the user experience, this article, which wants to be very concrete, summarizes a small own advices in writing blogs. Blog ebook distribution either as freebie or as premium content is a great way to promote as well as to monetize from your blog. Creating ebook however needs knowledge. thanks Abhishek for sharing Feng-GUI with your readers. one important comment: take a screenshot of only the interior of the webpage and do not include the browser surrounding toolbars and UI in the image. We will change the text and screenshot as per your recommendation as soon as possible. Thank you very much for the valuable comment and for developing an useful tool. 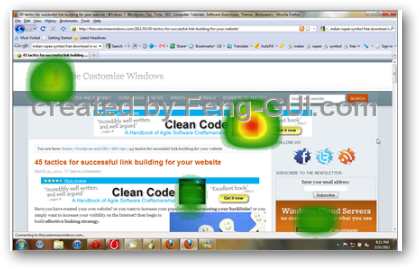 Cite this article as: Abhishek Ghosh, "Estimate where visitors look on your website using online simulator," in The Customize Windows, March 31, 2011, April 20, 2019, https://thecustomizewindows.com/2011/03/estimate-where-visitors-look-on-your-website-using-online-simulator/.